Don’t tell anyone we told you, but a Pretty Place wedding might be South Carolina’s best kept bridal secret. This chapel, found on the grounds of Camp Greenville, is perched on the side of a mountain, which affords the covered ampitheatre views that are so stunning they seem unreal. Here, in this small open air chapel down a winding mountain road, is where Ashlyn and Matt chose to commit to one another forever. Their joyful wedding day was filled with incredible moments both big and small, and the awe-inspiring ceremony was the cornerstone. Planning an outdoor mountain wedding in Upstate South Carolina in November can be tricky as the weather cools dramatically in the fall, but Ashlyn and Matt ensured that everyone was comfortable and warm for the ceremony. Their bridesmaids wrapped up in cozy blanket scarves, and their guests came prepared in coats and gloves. 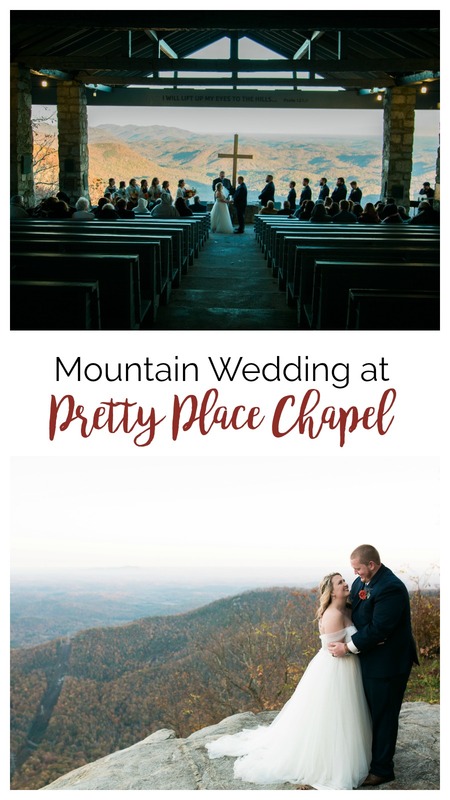 The couple exchanged vows at Pretty Place Chapel just as the sun was going down for a burst of color against the mountainside, then headed back into Greenville to party the night away at the Upper Room. “The day of Matt + Ashlyn's wedding the sun was shining and it was pretty cold. The girls got ready at The Upper Room and the guys got ready at a local AirBNB. “Matt freaked out when he saw Ashlyn for the first time in her dress. He had tears running down his face before he ever saw her. He told me that he was so incredibly lucky to be marrying her because he’s known since middle school that she was incredibly special. Editor’s note: see the finished painting at Ashlan and Matt’s reception further down the post! “Ashlyn is so sweet and such a romantic person. All the time and careful planning to plan such a thoughtful and warm celebration was amazing. She is such a sweet and warm person so it was no surprise.